I'm not sure what is happening with the weather this week in Indiana...but let me tell you my car told me it was 50 degrees outside at 6:30 a.m. this morning...crazy! It is so exciting to have such great weather as Indianapolis gets geared up to host the "Big Game" (not using the trademarked name...just in case). Hopefully, the weather holds through the weekend so we can show everyone that a "cold weather" city can be just as fun as those "warm weather" ones. The weather is SO nice that the ice sculptures are melting! Who would have thought? I headed downtown after work last night to experience festivities. We didn't have tickets to the NFL Experience or for the zipline (I'm bummed about that) but it was fun to see how downtown has been transformed and see all the people enjoying themselves. I only snapped a couple of shots so to get the full experience, head over to Amy's post at a Latte with Ott, A. She and her husband did the whole experience (minus the zipline)! 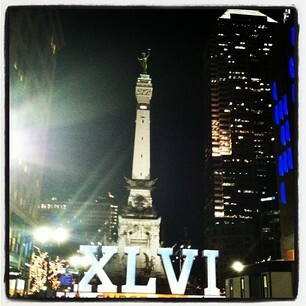 Coldplay was blasting from the speakers on the Circle. 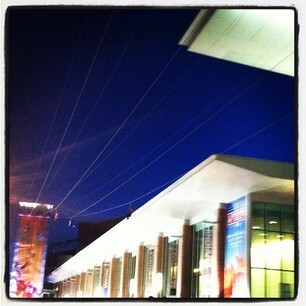 Can you see the folks on the zipline? 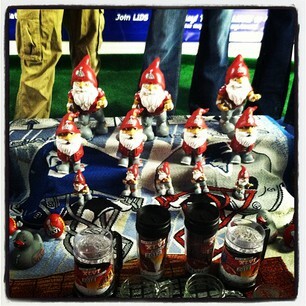 Love the SB Gnome window display! Wish we could sneak down there for a real peek! Love all the posts that show me what we are missing. Looks like so much fun! Sounds like the weathermen are still trying to figure out where the LOW is going to go this weekend. It's making for an interesting forecast for Saturday and Sunday. Our guys up here keep changing their mind each day. Stay tuned and be ready for anything. Wonder if our visitors have experienced one of our 60 to 0 degree weather changes in three hours. Hang on!